With the latest iOS 7 being launched just few weeks back, first thing that any person would do is to stack it up against Android. Lets take a look at all the features that each OS offers and obviously compare! While this is not necessarily the most important aspect of a smartphone, the lock screen is there to greet the user every time he or she takes the smartphone out of sleep mode. The good news is that iOS 7 will feature a new lock screen, but the bad news is that there’s nothing “revolutionary” about it. More so, it’s a carbon copy of Android’s lock screen, featuring floating bubbles in the background, fonts similar to Roboto and a minimalistic clock . The iOS lock screen has also been enhanced by the presence of notifications. With iOS 7, users will be able to access the notification area directly from the lock screen, a feature that has been available on Android for quite some time. Apple has introduced a new feature in iOS 7 called Command Center. Users will have the ability to swipe up on the screen, thus gaining access to this new quick settings panel. 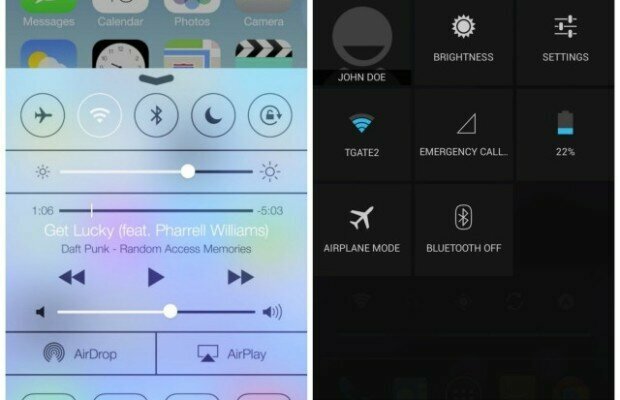 The Command Center includes toggles for Wi-Fi, Bluetooth, music controls, Airplane mode, brightness settings and more. Although Google has only recently introduced such a feature (Android 4.2), a similar panel has been available on a wide range of Android smartphones for quite some time now, thanks to proprietary user interfaces developed by the smartphone manufacturers themselves. Multitasking has been a feature that Android did a much better job at in the past, but Apple wants to turn the tables. iOS 7 will feature a new style of multitasking that will allegedly study the user’s behavior and adapt accordingly. In other words, applications considered to be more likely to be re-accessed will continue to run in the background. The apps considered by the system to be less important will have a lower priority, thus extending battery life in the long run. The concept sounds really interesting and hopefully it will deliver on its promises. With iOS 7, Apple will also implement a handful of changes in its proprietary browser – Safari. However, most of these changes are visual and include features such as quick access to tabs, 3D effects and scrolling. Not much innovation here, since all of these characteristics have been part of Chrome for a long time. Nonetheless, a step in the right direction. This isn’t something that is necessarily too important for iOS users, unless of course they actually prefer the stock iOS Mail app. As expected, the iOS 7 Mail application has received several new features of its own, but interestingly enough, Apple has mostly been inspired by the popular “Mailbox” 3rd party app (available in the App Store). Features such as swipe to archive / delete have been added, which have been available in Mailbox or Gmail for quite a while. Before announcing a verdict we should also mention that iOS 7 will introduce a handful of other features not mentioned above, such as auto-app updates, semi-live wallpapers, a new calendar app, navigation drawers, iTunes Radio and several other smaller tweaks. Long story short, iOS 7 will implement a wide range of new features that are most welcomed. Yes, the majority of these additions are inspired by what Android already has to offer, but that’s how the industry works. Manufacturers and developers usually inspire one another, and the technology moves forward. However, the disappointing part is that, once again, the word “revolutionary” has been misused. While iOS 7 is a modern-looking platform which has been more or less brought up to date, there’s not much “revolution” going on. At least not from the perspective on an Android user. Nevertheless, iOS 7 is definitely a step in the right direction, and that’s something to look forward to. But what do you think? Did Apple do a good job “borrowing” ideas from Android? Are you comfortable with this idea, as an iOS user? Let us know in the comments section. Next Story → Samsung Galaxy S3 Android 4.2.2 Leaked!